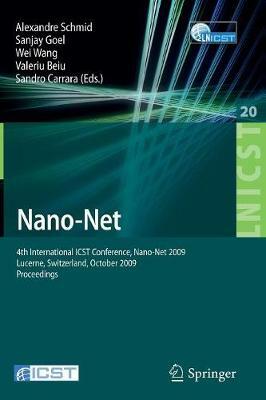 This book constitutes the proceedings of the 4th International Conference on Nano-Networks, Nano-Net 2009, held in Lucerne, Switherland, in October 2009. The 36 invited and regular papers address the whole spectrum of Nano-Networks and spans topis like modeling, simulation, statdards, architectural aspects, novel information and graph theory aspects, device physics and interconnects, nanorobotics as well as nano-biological systems. The volume also contains the workshop on Nano-Bio-Sensing Paradigms as well as the workshop on Brain Inspired Interconnects and Circuits.